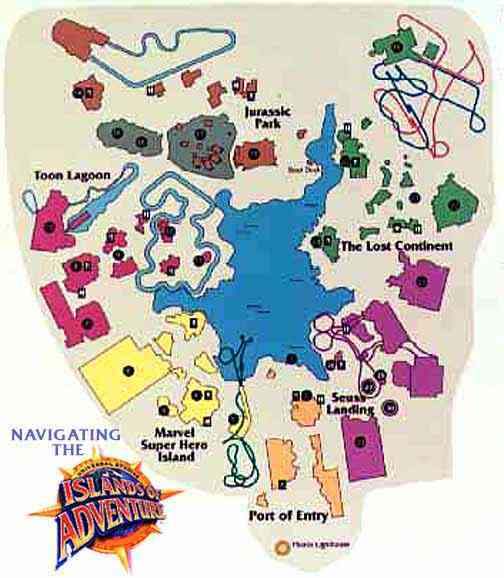 Absolutely Florida - Universal Studios Escape! Steven Spielberg, creative consultant at Universal, had a hand in the creation of this all-new addition to the park. This is most definitely the state of the art-the technical wizardry is extremely impressive and sets the new standard for excellence in the theme park experience. Bravo! Absolutely awesome. Using 3-D effects eerily brought right into your personal face by the use of special glasses, you'll have a hard time remembering that this isn't real. (or is it?) Technically, way beyond the Back to the Future ride that was the previous champ for visual thrills, many will have a hard time keeping their eyes open as you go on a pyrotechnical extravaganza that will have even the most jaded techno-brat fumbling for superlatives. 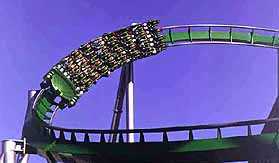 Probably the best ride on the planet right now. Just what you'd expect-a sheer terrifying drop from an open-air tower; not recommended immediately after lunch. 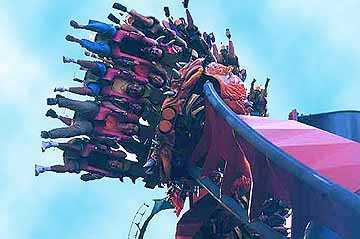 After being shot from 0-40 mph in 2 seconds (the same thrust as an F-16 fighter jet) this mega-coaster will make you weightless and take you upside down and underground in a ride that's not for the overly sensitive. Take me, for instance-I chickened out! This is ideal for younger kids who probably couldn't handle the more intense rides. Great fun- especially the soaking- new Popeye and Bluto's Bilge-Rat Barges. Totally cool. A brilliant water ride featuring Mega realistic dinosaurs, including an enormous 5-Story T-Rex that almost gets you before you plunge almost vertically down an 85 foot chute. As you exit you can buy a picture of yourself looking silly to show the folks back home. A live action and surround-animated recreation of Zeus and Poseidon's battle with fire balls and water blasts way down in rockin' old Atlantis. Vortexes, whirlpools and more. Very well done, and not too scary for the young 'uns. The only ride of its kind in existence, two coaster cars dubbed fire and ice set off on different tracks, missing each other by eighteen inches three times as you whiz round the track in one car or the other, upside down more than a few times. A very nice and cute complex for the very young (under 5), who can get their fill of Cat-in-the Hat -related nonsense from all their favorite characters from the books. A carousel, cool rides and lots of other fun will keep the little darlings enthralled for at least an hour. WOODY WOODPECKER'S KIDZONE is a new attraction just for kiddles under 10 that lets them have endless fun with water and foam balls, with a specially built kiddy-coaster amongst the diversions. Curious George also figures into the goings on. Based on the movie, this is a terrifically assembled recreation of a typical little Kansas town -- then the twister approaches and the fun begins. As you leave, Bill Paxton from the movie congradulates you "for surviving Twister." A visit to Universal Studios is an essential destination for anyone who loves the larger-than-life world of movies and entertainment. Great attention has been paid to the set design, making for a magical and thrilling movie-like experience. 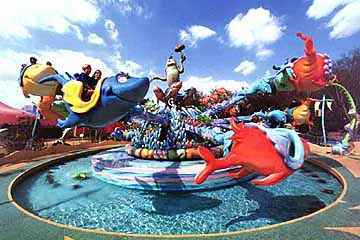 For more about Universal Studios Florida, click here..